This appears to be a junior synonym of the genus Multiporina d'Orbigny, 1852. Multiporina is considered as a nomen oblitum. Schizoporella semilunaris Saulea-Bocec, 1943 Neogene Miocene Serravalian? Moldova? 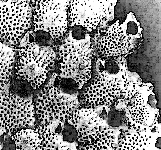 Schizoporella spongitiformis Saulea-Bocec, 1943 Neogene Miocene Serravalian? Moldova? Schizoporella tuberculata Saulea-Bocec, 1943 Neogene Miocene Serravalian? Moldova? The list below is of species identified as Stephanosella without later revision. The type species of Stephanosella is Eschara biaperta Michelin, 1848. Many Recent specimens have been misidentified as this species, including Buffonellaria divergens (Smitt, 1873). See Ryland (1969). Schizoporella errata Schizoporella japonica Schizoporella sp. This list includes many entries assigned to the genus with dubious validity. Also, some species may be omitted. Critical comments would be appreciated. Schizoporella cornuta - at the Smithsonian Marine Station at Fort Pierce, Florida. Schizoporella floridana - at the Smithsonian Marine Station at Fort Pierce, Florida. 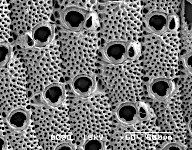 Schizoporella sp. - from San Francisco, at the California Academy of Sciences.